Habitat: Brazil. Encyclia bracteata is found growing in the Brazilian state of Espirito Santo in forests near the Atlantic coast. Plant Size: Small. Encyclia bracteata has small pseudobulbs and one narrow, fleshy leaf. 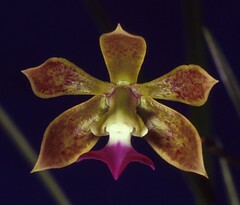 Flower Description: The petals and sepals of Encyclia bracteata are molted green and brown with green edges. The lip is bright magenta and contrasts nicely with the petals. One flower per growth is typical but well-grown plants can produce up to three flowers on one stem. Additional Information: Encyclia bracteata is best grown mounted on cork or grown in a slatted basket. It is easy to grow and produces attractive flowers.